If Cubans were to list recent U.S.-Cuba trade policy changes that seemed good in theory but were unlikely to have a significant impact on their daily lives anytime soon, they might start with online shopping, according to interviews with Bloomberg BNA in Havana. The Obama administration released the last of six packages of executive orders in October. Within it was a provision that permits online retailers in the U.S. to sell products directly to Cubans for their personal use including items like televisions, toothpaste, clothing and soap. In its two-year effort to normalize relations between the two countries, the administration has said it tried to prioritize humanitarian engagement and improvements in the lives of average Cubans. “The theory is that more openness and more interconnectivity benefits the Cuban people,” one senior administration official said during an Oct. 14 press call announcing the most recent policy changes. President-elect Donald Trump has threatened to roll back the policy changes unless Cuba makes concessions, which has dismayed lawmakers and lobby groups who say that, among other benefits, the new policies have helped foster Cuban entrepreneurship. Some Cubans told Bloomberg BNA that they were dubious about the prospect of online shopping. It presents a logistical quandary, they said. Wi-Fi on the island remains limited to designated outdoor hotspots. On any given day, one can walk through Havana and see people making international internet calls and checking e-mails from benches.At one Wi-Fi hotspot at the intersection of two main streets, Linea and L, a young woman who identified herself only as Adriana was selling Wi-Fi access codes. The pay-per-hour access cards are generally sold at government-run kiosks. But the supply can start to run low by early afternoon, presenting an opportunity for people like Adriana to make black market sales. Bloomberg BNA, whose interviews with Cubans involved a translator, asked Adriana what she thought of the prospect of buying U.S. products online. Adriana said she looked forward to buying clothes and shoes, which are expensive and often of low quality in Cuba. But she also said she worried about the slow, spotty connections in Havana. Cuba’s telecommunications agency, Empresa de Telecomunicaciones de Cuba (ETESCA), offers 2G standard mobile services capable of handling phone calls and text messages for approximately 85 percent of the population. ETESCA also has roaming agreements with more than 100 foreign telecom carriers, including Sprint Corp. and Verizon Communications Inc., and it recently signed a deal with Alphabet Inc.'s Google to expand services. 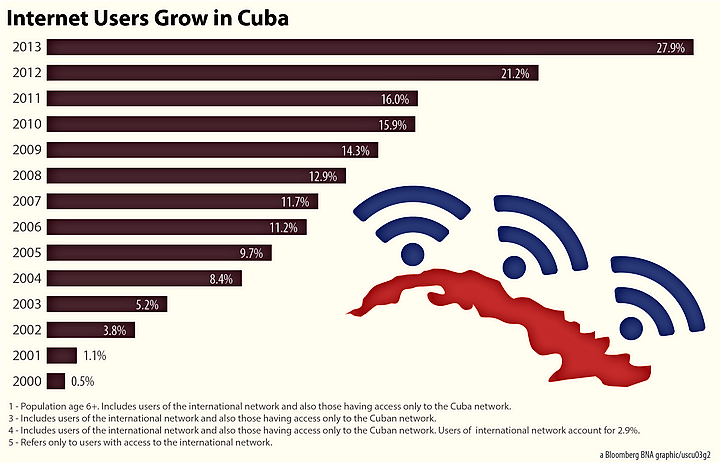 Also, the government announced in December that it would launch a two-month trial that would connect 2,000 homes to the internet in the Old Havana colonial district. However, ETESCA has not yet established continual access along the major thoroughfares of Havana, which has a population of more than 2 million, according to a recent report from the U.S. International Trade Commission (USITC). Internet connections are just one concern. Once Cubans successfully navigate slow internet connections and purchase products online, the next question is: Will the products actually get to them? The U.S. Postal Service resumed direct mail service to Cuba in March. But a U.S.-Cuba agreement to resume flights between the two countries applies only to passengers and parcel post, Ivan Chacon, the head of international relations at Cuba’s Ministry of Transportation, told Bloomberg BNA. Cargo packages are not included. That’s one of several challenges, he said. The reason U.S. packages are not currently being shipped to Cuba by plane is that the Cuban government has not permitted it, John Kavulich, president of the U.S-Cuba Trade and Economic Council, said. The civil aviation arrangement between the two countries allowed for United Parcel Service and FedEx to extend operations to Cuba. But the Cuban government has not authorized the services, he said. Further, he noted that the Obama administration has granted U.S. companies, including retailers, permission to establish distribution centers on the island but they also need approval from Cuba, which they have not received. If packages arrived, they would need to go through Customs, a prospect that some Cubans said they also found discouraging. “In Customs, when they see a confusing package they will never deliver it and they will never give any explanation for that,” said one young man at the hotspot on Linea and L, who declined to give his name. “Probably only 1 percent of the people who buy on the internet will get their packages here,” he said. All of these complications reflect the Obama administration’s eagerness to push through changes without really negotiating with the Cuban government about how they would be implemented, Kavulich said. The administration was working under the assumption that Hillary Clinton would win the election and as president would continue talks with Cuba, he said. The Cuban government also thought Clinton would win, he added. The policy changes look good but lack substance and the majority of Cubans have not been directly affected, Kavulich said. Cuba has a dual currency system that includes the Cuban peso (CUP) paid to Cubans and the Cuban convertible peso (CUC) used by tourists. Neither are exchangeable in foreign markets, and it is unclear if they would be accepted by U.S. online retailers. The National Retail Federation, whose membership includes online stores, did not respond to a request for comment. Amazon.com Inc. and eBay Inc. also did not immediately respond. Discrepancies between the two countries’ banking systems have plagued attempts to re-establish normal business relations. “We have a group of procedures, which are certainly not 100 percent compatible with the American system,” Chacon said. He added that the banking system and payment methods are subject to a series of resolutions from the Ministry of Commerce, which decides what regulations should apply to imported goods. The lack of a modern banking system in Cuba, the government’s unfamiliarity with the market economy, and the dearth of investment-related regulations on the island are real concerns, Deitra Crawley, a partner at the Atlanta-based Taylor English Duma LLP, said. Crawley leads the Atlanta-Cuba Direct Investment Exchange, which fosters conversations between Cuban government officials and businesses in Atlanta. She said her firm has been advising the Cuban embassy as it works to establish new business practices. Some of the items that must be settled before normal business relations can begin include agreeing on basic contract terms and deciding which country’s laws govern partnerships, Crawley said. But more steps will need to be taken before the average Cuban benefits from the trade policy changes, the young man at the Linea and L hotspot said. For example, most Cubans don’t make enough money to even think about shopping online or buying U.S. products, he said. Cuba’s average salary is $20 per month, according to USITC. Only Cubans with relatives outside the country who could buy the items for them would really reap the rewards of online shopping, the man said.